A few weeks’ holiday each year and some time off when you’re sick aren’t big asks. Most of us take them for granted. Too often, insecure workers, however, are forced to work while sick and avoid taking holidays. Hundreds of people recently told us about their daily experiences of insecure work. Hundreds of people recently told us about their daily experiences of insecure work. 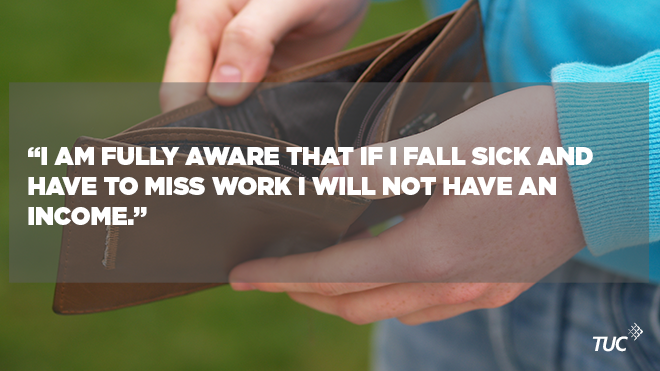 Many in insecure work told us how they drag themselves into work while ill. They simply cannot afford to take time off when sick. No sick pay means I’ll spend two days bedridden and then have to work as I can’t afford time off; despite not being fit to work. One duty manager in a pub working on a zero hours contract has been told repeatedly by her doctor that she needs time off to recover from a back injury. An agency worker in his 50s told us how he badly suffers from asthma but suffers through work so he can feed his family. Sick leave isn’t an option for either of them. The impact on their finances would be too much. These aren’t unique or extreme cases. 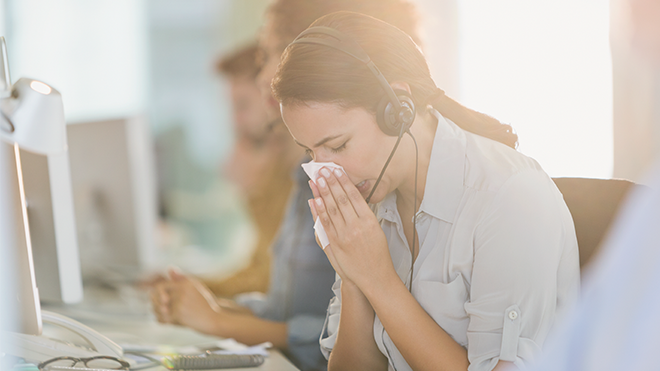 Suffering through work while sick is a common problem for insecure workers. They’re forced to choose – get better but lose money, or earn money at the risk of their health. Many may be entitled to statutory sick pay, but this only kicks in after four days. Nearly half a million people on zero hours contracts, or in insecure temporary work, do not qualify for statutory sick pay. This is because they earn too little to qualify. Currently, individuals must earn at least £113 a week to be entitled to statutory sick pay. The problems are not limited to sick pay. Taking leave for a holiday was too costly for many insecure workers. I can’t afford to take holidays or be off sick as it means a lower wage that month. 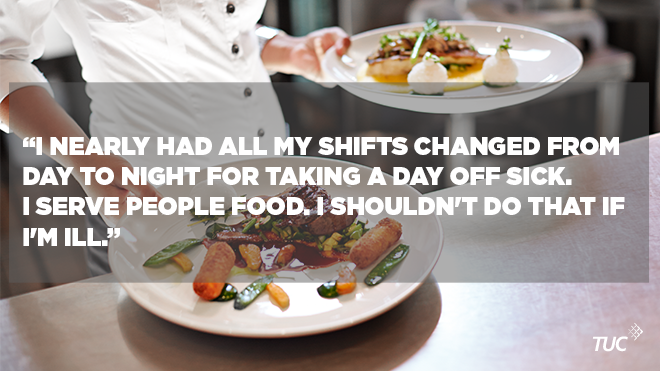 For those who have no set hours and rely on work being offered, going can mean missing out on desperately-needed shifts. I can’t plan anything or go on holidays because I don’t get paid enough and I need to be available for work just in case there’s any. Workers face more than just financial obstacles. A shocking number of people told us that they were threatened if they took sick leave or holiday. No sick pay. Threats of being fired due to sickness. Similarly, a bartender told us that she faces being sacked if she requests a holiday. It’s not always an explicit threat. Some of those who do take holiday or sick leave are often made to feel guilty for doing so. I have bad cases of tonsillitis and when I come down with it, I’m worried as I have to take time off work. My boss has a way of making it a massive deal. I don’t plan on being unwell. Some respondents were unaware or confused about their rights to holiday pay and sick pay. Some may have been intentionally uninformed. The bartender that faces the sack if she requests a holiday added that she had no idea if she was actually entitled to any holiday, as she’s never seen her contract. A barista said that she’d never brought up the issue of sick or holiday pay. She needs the money and doesn’t want to risk losing her job by asking. What’s clear is how these themes overlap and relate. Unpredictable hours lead to fluctuating pay and financial insecurity. This insecurity forces workers to accept any shift, either because they need the money or they fear the consequences of not doing so. Fear of turning down a shift and financial insecurity then have such an impact that workers would rather turn up sick than take a day off. All of this is symptomatic of a power dynamic that favours employers – some of whom are openly hostile to their workers. The employer gets a flexible workforce to meet their demands. Workers, on the other hand, put up with financial insecurity, a fear of losing shifts and the threat of being sacked at any moment. Alex is a Policy and Campaigns Support Officer for the TUC's Economic and Social Affairs Department. As a committed supporter of TRADE UNIONS,also an ex T. U. Lay official,reading what I just have does not surprise me. Why ? Because without every worker,being encouraged to join a Trade Union,and Trade Unions,saying clearly that they will stand shoulder to shoulder with all other Trades Unions in struggle, workers in and outside Trade Unions, will continue to struggle and feel isolated. I remember this being the case in the 1980s and 1990s when the Tories were last in. I had to pay bills and mortgage on half weeks wages. It was all in favour of the employers agenies.